Higher education today is experiencing somewhat of an existential crisis. The cost of college tuition is skyrocketing, the original purpose of the university appears to have been lost, there is massive administrative bloat, and fewer students can afford to go to college, while those who do attend have disappointingly high dropout rates. While Carey does not attempt to address all of the myriad problems associated with academia, he does provide a valuable exploration of the role that high technology can play in the coming decades. 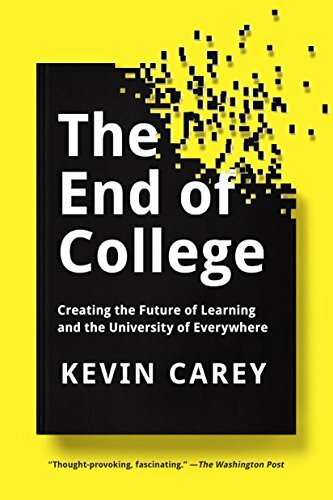 While today’s colleges and universities are largely “site-bound” (relying on physical facilities and people at a specific place), Carey envisions the educational institutions of tomorrow as existing in cyberspace and being accessible to anyone with a computer and an Internet connection. He reviews the history of higher education in the United States, with focus on the last 100–150 years. A number of leaders in the field (often college/university presidents) have challenged the existing paradigm, but little was accomplished. The question was often raised about the role of faculty and their responsibilities. Great scholars are hired who have never taken a course in how to teach. Their scholarship is paramount, and their involvement with students is often not rewarded, with their teaching assignments being grudgingly fulfilled. Administrators do not get off lightly, either. Too many follow a business model that today leads to bloated staffs with overlapping and poorly defined functions. Much effort is spent on the amenities of the institution (fancy dorms, elaborate athletic and workout facilities) instead of a focus on developing a quality, meaningful educational experience. Carey spends the bulk of the book looking at how high technology is beginning to have an impact on learning. Pioneering efforts at developing MOOCs (massive online courses) at Harvard, MIT, and Stanford have led to enrollments of thousands of students from across the world. Many of these courses are free—while the institutions are not yet offering them for credit, students do often receive certificates of completion. The role of independent startups (out of Silicon Valley and elsewhere) are covered in detail, as he looks at both the successful and not-so-successful efforts to make learning available to more people at more convenient times at less cost. President Obama recently proposed a plan for paying for the first two years of college (at tax-payer expense, of course), but his model relies on the same delivery system: sit in class, listen, and take one or more tests. Carey has a much broader vision for all aspects of higher education. He asks the question “Why go to college at all?” His proposal includes certificates of accomplishment as a student develops various skills. Some of this approach currently exists in associate degree programs and certification programs where a student demonstrates mastery of a specific skillset and receives a certificate of accomplishment. Carey focuses on questions of large-scale delivery and does not get involved with other problems associated with our current higher education system. He does not touch on the issue of “publish or perish” academic research (much of which is never read and has no influence on the discipline), although he does recognize the role that external grant funding plays in supporting the present educational model. Nor does he look at one major public concern: the indoctrination of students by faculty (usually very liberal) who prefer to teach their pet doctrines instead of a true exploration of the discipline. Although he does not mention it specifically, there are some references to disciplines that seem to serve no useful purpose other than to provide employment for some faculty. It remains to be seen how these changes will benefit the average college student who increasingly shows up on campus reading and writing at the eighth-grade level. Certainly the student of tomorrow will need to be trained how to learn, not just how to pass a test. Perhaps by removing the distractions of campus extracurricular activities, the student of tomorrow will be able to focus better on the process of learning. Kevin Carey has written a challenging book, one that deserves careful attention from everyone who has any investment or interest in education. Some of his ideas seem wild and impractical, but they are what is needed to change our educational system for the better.